Barb and I discussed some ideas for our next class over lunch on Saturday. She thought we could show a sewing exercise book we purchased several years ago. The book was a class project for girls at the Kildard Place School in Ireland. These schools were established throughout the country to educate the poor. The idea was that every individual should have an opportunity to read, write and do arithmetic. Just because you were poor didn't mean you had to be illiterate too. The young girls also had classes to develop their sewing skills. We know this sewing exercise book was considered important to the young woman as it was not left behind when she immigrated to Australia. I don't imagine she was able to take many things with her on the ship....but she made room for this item. It then traveled from Australia to Kansas where it is at home for now. 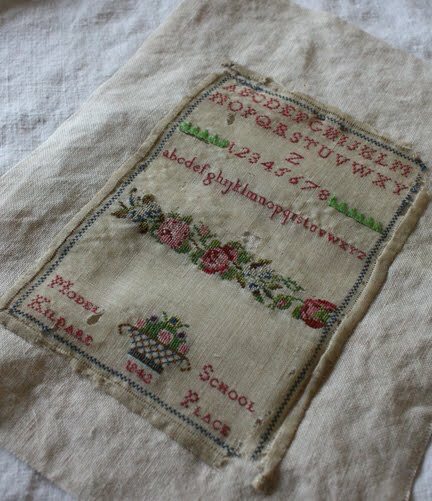 The sampler has suffered a bit through the years and I thought I should sew it to another piece of linen to prepare it for another trip. Then I noticed the pin. I thought, "What the heck!" How had I not seen this before? The pin that held the sampler in place on the book page is rusted to the linen! This reminded me of a quilter that came into the shop where I worked years ago. She held up her quilt block and showed me a couple of her pins that had rusted to her quilt fabric. (She hadn't worked on her project for quite a while!) She asked me what she should do.....now I'm in the same mess. What to do? I think I'm just going to leave it for now. 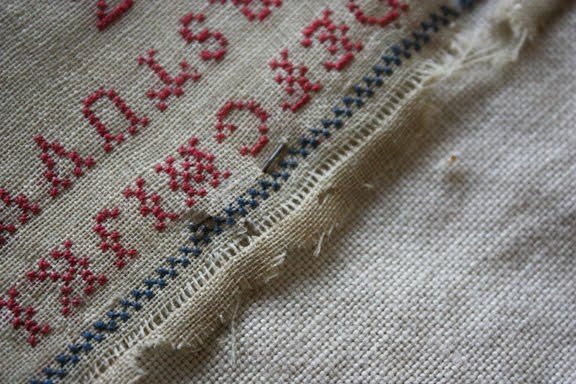 Take a look at this: http://www.marthabeth.com/stains.html This is written by Marth Beth Lewis, a needleworker. She has various tips, including a section on rust, and an "elixir for antique textiles." I haven't tried any of these ideas, so i can't vouch for any of them. Good luck!! I agree with Joy...leave the pin! The roses in this piece are lovely. What a lovely keepsake.I would leave the pin. It was put there for a reason and is a part of a memory of leaving home. I would be very afraid to try to get it out anyway. I'd leave the pin - it becomes another part of the story of this lovely piece! Definitely leave the pin, it is part of the treasure!! What a wonderful piece and a great idea for a new version. I agree with Jo, leave the pin, it's a sweet part of the story of this little piece!! I heard a story up north about an elderly woman who died while working on a Hardanger piece. The family left her needle where it was and had it framed...her last moment of happiness! Leave the pin! Oh Alma, if it were mine I'd leave the pin as is. It is part of the history of the piece. I love the roses! Thanks for sharing the picture. Looking at it, my mind went back oh so many years when I was in elementary school and we had embroidery classes as part of the curriculum. The only piece I have is a small table cloth and napkins that I stitched when I was 12. I still use then for display and have a picture on my blog. Looking at it makes me smile! LOVE the emery box...please, please make some to sell!!!! I would frame it leaving the pin in place - it's part of the charm. 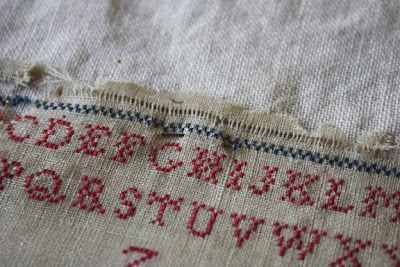 I saw a framed, unfinished antique sampler once that still had needle and thread attached. A card said the stitcher had passed away before the sampler was finished. Yeah, I think I'd leave it where it is too. It's a lovely piece. What a lovely piece! I'm like the others -- I would leave the pin as it is. It's part of its history. Thanks for sharing the piece with us! Oh dear, I hope you are not too busy to get the new halloween/fall quilt pattern out in the stores, the one that looks like Rachel's wheel? Please please, I ordered the fabric from quilters station, hope I got that right, anyway, the Quilt shop that you had the class for the quilt at. You're dancing on the head of dilemma, for sure, Alma! If you leave the pin, it will continue to corrode your piece...if you remove it, you will destroy some of the history of the piece. 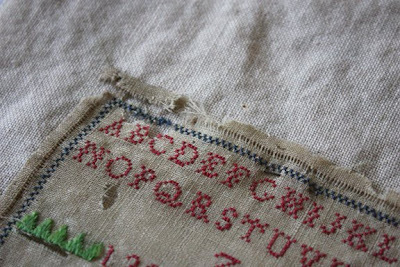 However, you have a verbal and hand-stitched history as it is. I would opt for preservation of the piece (as a former textile conservation intern with the Boston Museum of Fine Arts)...and I might put the pins in a wrap of acid free paper and attach them with a note for referrence. The only thing we used at the Museum to restore any of our textiles was distilled water in the smallest of quantites...applied by q-tips...gingerly....and frequently refreshened q-tips so as not to redistribute the dirt/stain. Water, itself, will stain. So be very careful. You just want to lift the rust as best you can. So, you might first opt for a gentle brushing off...but, don't tear the fibers. Do you two know how lucky and blessed you are to "conspire" together on your projects! Finding one true friend in life is so rare. Finding kindred spirits to work with is even rarer. What a beautiful piece! I would leave the pin - it's just a part of the piece's history. The PIN has to stay! Taking it out would be like taking out one of the stitched letters. The young girl placed it there and most likly has her fingerprint on it! The stories that pin could tell if possible. By-the-way how did they make straight pins back then and what did they make them out of? What a cherished treasure! Luv it. I bet Mary Corbet from needlenthread.com would know what to do. 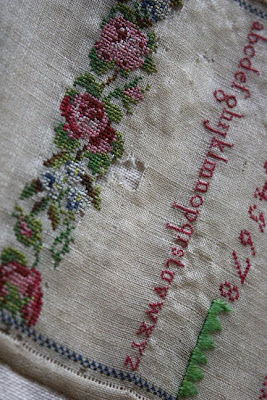 She does a lot with ecclesiastical type of embroidery. Very skilled lady. Or because it is actually a historical sampler, perhaps leave the pin. Oh, how neat!! I never hear much about sampler or embroidery stitching in Ireland, so it's always fun to see samplers from a time when the country was so poor. I googled the Kildare Place School--neat to see it is still in existance, even if it's in a different form! It's very beautiful and looks like french marquoir. I've some of these at home, but i prefer those which are red. Barb and Alma, I am so happy you showed this at your class. I was there and I loved it !!! 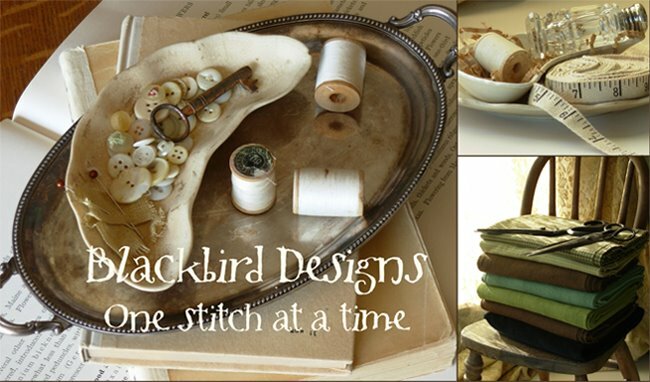 What a treasure you guys have, and I love the way you honor the young woman who created the sewing exercise book. It is precious !! I have truly enjoyed your class. Thanks !! They're unreasonably capable with charm incredible workmanship that makes them a huge amount of eminent. Don't you wish to have women in your bed that welcome the best techniques to fulfill you Islamabad escorts We tend to predict still as foresee satisfaction in your life once you converse with the US about picking the right females of your group. Simplicity of picking escorts in the national capital.